An Interview I did with Guha Shankar, a keynote speaker at the Hawaiʻi Library Association’s 2018 conference, was featured in this winter’s HLA newsletter. That version, which was edited drastically due to space restraints, can be viewed here. I was fortunate to not only interview Shankar, but also meet him in person at HLA. 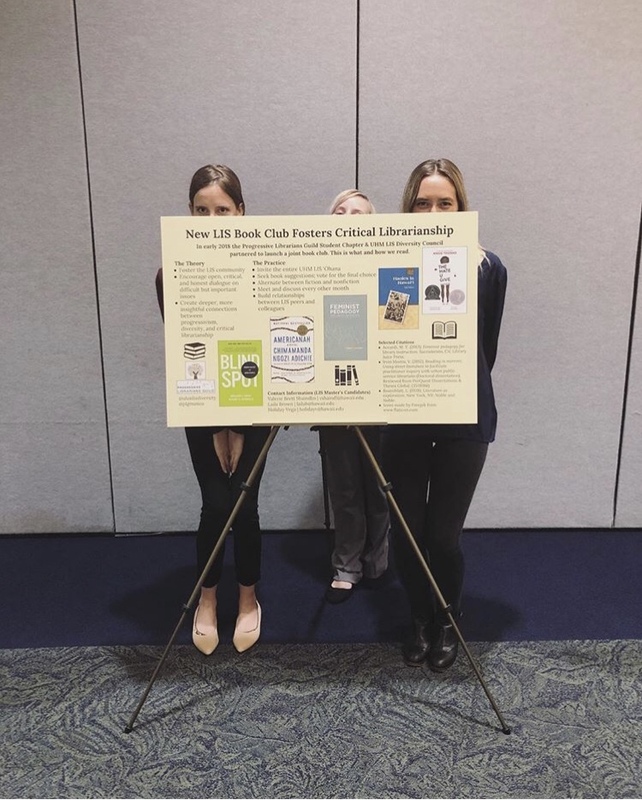 We crossed paths during the poster session, at which two friends and fellow students and I presented a poster about our LIS bookclub (see silly pic above). I very much enjoyed hearing his insights, personal experiences in the profession, and feedback about not only our book club, but diversity work in general. Shankar is a Folklife Specialist in the American Folklife Center at the Library of Congress in Washington, D.C. This was his second visit to Hawaii; his previous visit was in 1992, “as the audio recordist for a video documentation crew that was filming a group of indigenous artists, mostly North American Native and First Nations community members. The artists were practicing and producing site-inspired work for a multi-disciplinary installation titled “This Path We Travel,” at the National Museum of the American Indian exhibition space in New York.” He has work and research spans myriad countries and cultures, and he is involved in a range of public outreach programs. What insights or questions from your research and work do you think are applicable to Hawaii in particular? My work centrally involves the process of producing and maintaining a documentary record of cultural production ranging from everyday aspects of social life (such as work traditions, domestic practices, local economies) to expressive cultural forms (such as dance, music, verbal and material arts) to political struggle (such as activist movements to affect societal change, dismantle colonialist legacies, fight racial and gendered oppression). All of these distinctive realms have already yielded rich research material in Hawaii but there’s more waiting to be uncovered. How did you become a folklorist? My introduction to folklore and more broadly, to ethnography, was on an experiential basis, that is, my initial foray into folklore was not by virtue of academic training in the discipline, but because I was hired as a documentary film editor at the Smithsonian’s Office of Folklife Programs back in the 80’s (yikes!). The OFP employed a number of vehicles for researching, presenting, and providing access to folk and traditional cultural formations, including public festivals, film production, audio recordings, print publications, and archival collections. When I arrived there in 1985, I was given 40 rolls of 16mm film rolls and told to go edit it for a film on South Asian marionette traditions. While I was editing film and learning about archival principles, I also got the chance to work on festival and event production and fell hard for the amazing and awe-inspiring community performers who appeared at the Festival of American Folklife, heard and saw unbelievable musicians, learned deep lessons about the role of emergent and diasporic cultural practices and ancient lifeways, and about how people with limited means went about “making a way out of no way.” I also accompanied professional staff ethnographers on field work trips and became proficient in field documentation, building on my undergraduate training in media production. Above all else, I learned how to listen to people, and to take the raw materials—film, video, audio, photographs—of that process of interaction with others and make an aesthetically-pleasing, artistic product that represented individuals and traditions in a way that approached the “truth” of their lives or aspects thereof. Does your own cultural heritage impact your work, and if so, in what ways? My cultural heritage is that of a nomadic, diasporic person, whose formal spaces of dwelling cover three continents and four countries over the course of the first fifteen years (to pick an arbitrary number) of my existence. As such “home” has always been a portable concept, which means that I can find ways to fit in a lot of different environments, and that ability to find my comfort level most anywhere has served me well over the course of time. At the same time I have been acutely aware, from a very young age, of the effort required to push back, subtly and/or explicitly, against the marginalization of people like me and our relegation to the narrow, passive subject position of a “third world” type. One of your academic specializations was “Folklore and Public Culture.” What does “Public Culture” encompass and why is it important to our work as librarians? Public culture means several things: In one view it is a seemingly paradoxical space, in that at the same time that individuals and groups come together seeking commonalities and togetherness, they are also deeply aware and cognizant of differences and distinctions among and between them. A related notion is that in contrast and opposition to the insular, nationalistic, corporate, stratification of social and cultural life, public culture strives for egalitarian, organic and fluid ways to organize and effect social change and crucially, elevates global citizenship as a goal and a public good. What advice do you have for librarians-in-training who wish to pursue careers involving Indigenous communities and/or materials? Prepare to be in this pursuit for the long haul—that is, you can’t helicopter in and out of people’s lives as you choose; only go where you are invited; and make sure you develop solid skills in areas that will be of practical benefit to helping them achieve their goals. Are there any lessons you’ve learned from researching such diverse peoples and materials, and/or any wisdom or advice you might be able to impart from your experiences? Be curious, learn from others’ experiences while sharing your own, and importantly, be open to encountering radical differences. It may well be the case you won’t like it or it will make you uncomfortable, but what’s the point of settling for the same-old same-old. Also see [the response to the previous question] above. You’ve written about access to cultural heritage materials. Considering that this includes intangibles, what does “access” mean to you, and how can we work toward greater access? When I write or talk about access to cultural heritage materials I am specifically addressing the fundamental importance of enabling the community of origin to have access to their items. There are established legal instruments mandating the physical repatriation of sacred and funerary objects, NAGPRA [The Native American Graves Protection and Repatriation Act] most obviously. As well, there are other procedures used by cultural institutions to provide such access, ranging from long-term loans of objects to communities of origin, to site visits, to digital tools and platforms that make intangible cultural heritage materials such as recordings of speech, song and music available to community members (such as the Mukurtu CMS). Access also exists in close relationship to control of the use, description and circulation of materials and objects of cultural patrimony according to the protocols established by the community. In another interview, you described your work as combining your “creative and political inclinations,” which is great since neutrality is essentially a myth; [if you agree,] can you please elaborate on why this is an important stance to acknowledge, especially for librarians? Insofar as I—a librarian and human—am a thinking, feeling, engaged and emotive being, then it is crucial for me to be involved in actions with other people which both further their goals and energize me, to the extent possible. Otherwise, I might as well bow out of the profession since it is one, in my view, that is predicated on the concept of service and constant, active learning.